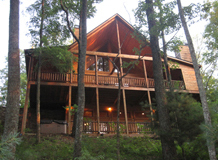 Mountain Escapes is a premier Georgia cabin rental company with vacation cabin rentals in the beautiful, North Georgia mountains, about 90 minutes north of Atlanta, GA or 90 minutes southeast of Chattanooga, TN. Conveniently located in Blue Ridge, GA within the Aska Adventure area, our cabins are close by an array of outdoor activities including hiking & biking trails in the National Forest, white water rafting, horseback riding, canoeing, tubing, kayaking, swimming, golfing, fishing, scenic driving and berry picking. In addition, you’re in close proximity to Lake Blue Ridge where pontoon boat & jet ski rentals are available and/or use of a boat slip are accessible. Meanwhile, our vacation cabin rentals are just a short drive away from the charming town of Blue Ridge, where you can enjoy the quaint shops and restaurants, antiquing or see the surroundings by taking the tour on the well known Blue Ridge Scenic Railway. And last, for those who prefer to cherish their time at the Georgia cabin rentals themselves, enjoy some bonding time while grilling out on our decks, watching the sunset and sunrise, snuggling up next to a fire at one of the outdoor or indoor fireplaces, playing billiards or merely enjoying the amazing vistas, something you’ll surely come back to see over and over again. Mountain Escapes offers North Georgia Cabin Rentals focused on Blue Ridge and the surrounding areas. Contact us at 888.908.1161 between 9AM-7PM EST.